Matheos is a native of Rochester, NY. He is best known as a Freelance Bassist, Instructional Method Book Author, and Music Instructor. have been published internationally by MEL BAY PUBLICATIONS. His Books cover just about every style of music. He is best known for his contemporary bass techniques including: Percussive Slap Bass, Two Hand Tapping, and Jazz Improvisation. MELBAY releases new full size editions of Chris' half size series books. 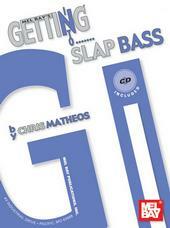 Including 100 Fretless Bass Workouts. January SF Bay area shows with Rockin Johnny Burgin. Including a planned live recording for a new cd with all new songs. January NYC Bluesman Bobby Radcliff performs some rare west coast concert dates for Cadillac Zack's Southern CA Blues Society.